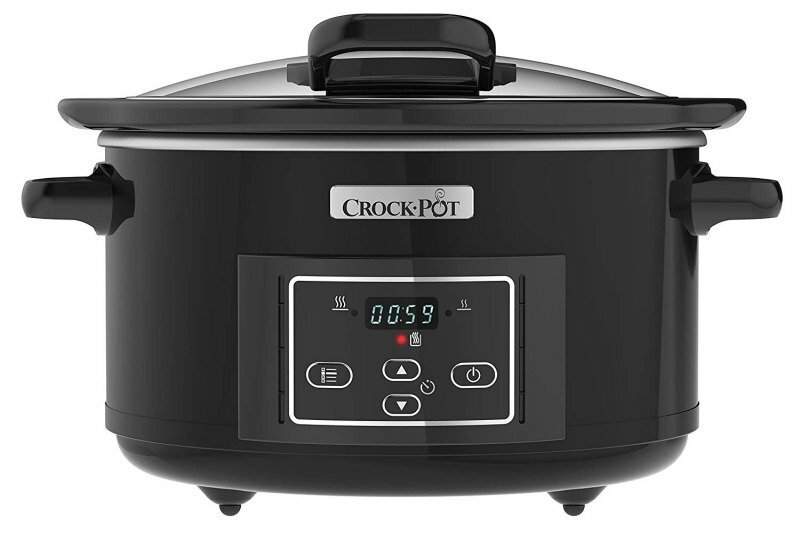 Our 4.7L SCCPRC507B Digital Countdown Crock-Pot will cater for up to six people, making it ideal for busy families or those who love entertaining. It features a built-in 20 hour digital timer letting you plan your meals ahead - just place your ingredients in the sturdy, oven-safe stoneware bowl, select your choice of 'High' or 'Low' heat settings, select the time you want to cook for, and go! Your slow cooker will automatically switch to keep warm when the time is up, so your meal will be ready when you are. The polished stainless steel and black accents of this sleek design fit beautifully into both traditional and contemporary kitchen designs. Our slow cookers truly revolutionise the way you prepare family meals, dramatically reducing the amount of time you need to spend in the kitchen. You can even prepare your ingredients the night before if you've got a busy day ahead, so all you have to do in the morning is take them out of the fridge, put them in the pot and choose your settings. The 20 hour timer on this model gives you full control over when the cooking process begins and ends, so you can always work around your plans for the day. There's no need to watch or stir your meal - you can leave the house knowing that your slow cooker will do all the work, transforming your choice of ingredients into a tasty, nutritious meal for you, your family or friends. Once the cooking process has ended, the slow cooker automatically switches to 'keep warm' mode so your meal is ready to serve when you're ready. Your slow cooker is ideal for a whole range of dishes, from starters and soups to casseroles, stews, pot roasts and even desserts. If you're cooking other dishes to accompany your main course, you'll love the countdown timer which helps you plan the timing of your meal to perfection. When your meal is ready, there's no need to remove it from the slow cooker - simply take out the bowl and serve it straight to the table. The bowl and lid are also dishwasher safe, so cleaning is very simple. This intelligent slow cooker has three settings that allow you the flexibility to prepare your meal in less time, if you need to. The high setting is ideal for when you need to rustle up a hot meal fairly quickly but you've not got the time to watch something bubbling on the stove. The low setting is for slow gentle cooking, perfect for tenderising cheaper cuts of meat and allowing the flavours of your ingredients to develop, combine and enhance. The keep warm setting maintains your food at the perfect serving temperature so you don't have to worry if you're running behind schedule. 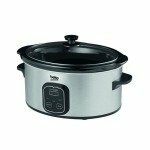 We've included recipes with this slow cooker, and it also comes with a 2 year guarantee. Compact design, ideal for kitchens with limited space.